At Computex 2016, ARM introduced a new mobile GPU Mali-G71 and Cortex A73 CPU. ARM Mali-G71 features a new architecture called Bifrost and support for the Vulkan API. The Mali G71 GPU is 50% better in graphics performance and a 20% power efficient. ARM Mali G71 also able to boost Laptop level performance and optimized for VR. ARM is confident that the new GPU can go head to head with an entry-level PC laptop GPU like Nvidia GeForce 940M with support for the 4K resolution. The Mali G71 is scheduled to feature up to 32 shader GPU cores. 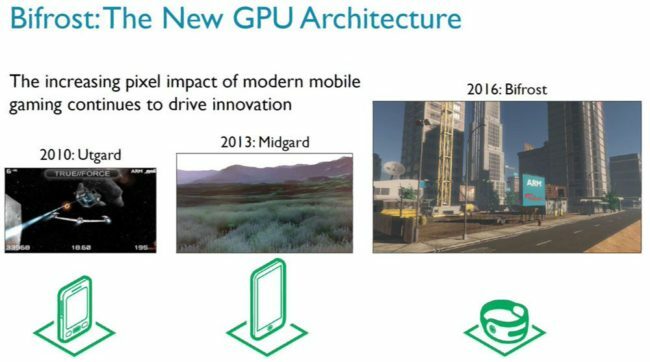 ARM new GPU is designed for better VR performance too. Mali-G71 supports 4ms latency at 120Hz screen refresh rates. The real test and benchmarks will start coming in next year. ARM has licensed the Cortex A73 to over ten partners including HiSilicon, Marvell, and MediaTek. The Mali G71 has been licensed by Samsung and HiSilicon, MediaTek.